Combine the water, milk, sugar and the soaked saffron in a 2-litre/quart saucepan. Place over moderate heat, stirring to dissolve the sugar. Bring to the boil, then reduce the heat to very low and cover with a tight-fitting lid. Melt the butter in a 2 or 3 liter/quart saucepan over low heat, stirring occasionally. Add the semolina, and slowly and rhythmically stir-fry the grains for about 20 minutes, or until they darken to a tan color and become aromatic. Add the flaked almonds to the grains towards the end of the toasting process. Raise the heat under the syrup, add the cardamom and the sultanas, and bring it to a rolling boil. Raise the heat under the semolina for 1 minute, stirring continuously. 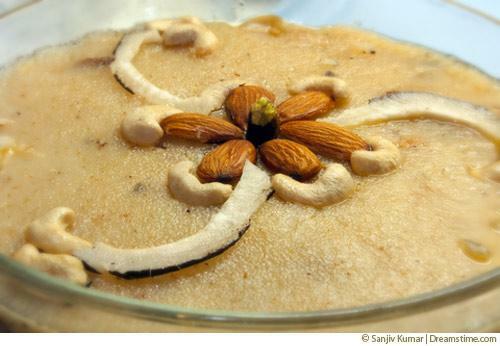 Remove the saucepan of semolina from the heat, and slowly pour the hot syrup into the semolina, stirring steadily. The grains may at first splutter, but will quickly cease as the liquid is absorbed. Return the halava to the stove and stir steadily over very low heat until the grains fully absorb the liquid, start to form into a pudding-like consistency, and pull away from the sides of the pan. Place a tight-fitting lid on the saucepan and cook over the lowest possible heat for 5 minutes. A heat diffuser works well. Remove the covered saucepan from the heat and allow the halava to steam for an additional 5 minutes. Serve hot.